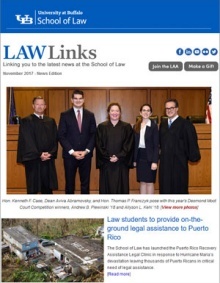 Law Links, the School of Law's e-newsletter, is emailed directly to subscribers once a month. Each issue includes feature articles, events, volunteer opportunities, photos from recent events, and student kudos. Also included is Class Action, a popular feature that contains career notes on alums, marriages, births and obituaries. If you haven't received Law Links and would like to be added to our mailing list, please send a message to law-communications@buffalo.edu or submit your information via the form below. To unsubscribe from Law Links, please send a brief message to law-communications@buffalo.edu.